Since 1951 the European Commission (and before that the High Authority) had a continuous civil aim: the stimulation of a European civil consciousness amongst a European public. One of the ways in which it attempted to achieve this was through the public communication of European citizenship, the meaning of which changed depending on the social, political, economic, historical and institutional contexts of European integration. 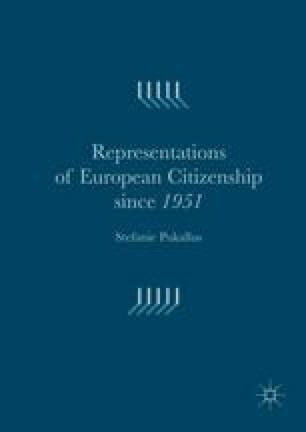 The different meanings of European citizenship are best understood as five representations which the European Commission communicated between 1951 and 2014: Homo Oeconomicus (1951–1972), A People’s Europe (1973–1992), Europe of Transparency (1993–2004), Europe of Agorai (2005–2009) and Europe of Rights (2010–2014). When combined they form an uninterrupted European civil narrative. Beck, U. (2005). Re-inventing Europe: A cosmopolitan vision. Talk given at the Centre de Cultura Contemporania de Barcelona on 27th October. http://www.publicspace.org/en/text-library/eng/b004-re-inventing-europe-a-cosmopolitan-vision. Accessed 17 Oct 2011. Beck, U. (2011). Cosmopolitanism can set Europe aright. Die Zeit 11.7.2011. http://www.presseurop.eu/en/content/article/751391-cosmopolitanism-can-set-europe-aright. Accessed 13 Nov 2011. Eriksen, E. (2008). The EU: A cosmopolitan vanguard? Paper to the ECPR fourth pan-European conference on EU politics, University of Latvia, Riga. http://www.jhubc.it/ecpr-riga/virtualpaperroom/038.pdf. Accessed 13 Mar 2012. Follesdal, A. (2007). If Union citizenship is the right answer, what is the question? In S. Piattoni & R. Scartezzini (Eds. ), European citizenship: Theories, arenas, levels (pp. 123–134). Baden-Baden: Nomos. http://www.follesdal.net/publ.htm. Accessed 12 Sept 2011. Offe, C. (2000 Manuscript, Sept). Is there, or can there be, a ‘European society’? http://www4.soc.unitn.it:8080/poloeuropeo/content/e64/e385/e395/offe-Europeansociety_ita.pdf. Accessed 14 Oct 2011. Offe, C. (2002). The democratic welfare state: A European regime under the strain of European integration. http://www.eurozine.com/articles/2002-02-08-offe-en.html. Accessed 4 Apr 2015. Sonntag, A. (2010). Political symbols, citizenship and communication, paper presented at the communicating European citizenship conference, 22 March, London. http://www.uaces.org/pdf/papers/1002/Sonntag.pdf. Accessed 25 July 2012. Stevenson, N. (2005). European cosmopolitanism and civil society: Questions of culture, identity and citizenship. http://eprints.nottingham.ac.uk/751/2/euroeuroarticle11.pdf. Accessed 12 June 2012. Weber, M. (1949). “Objectivity” in social science and social policy. http://anthropos-lab.net/wp/wp-content/uploads/2011/12/Weber-objectivity-in-the-social-sciences.pdf. Accessed 14 Oct 2014.